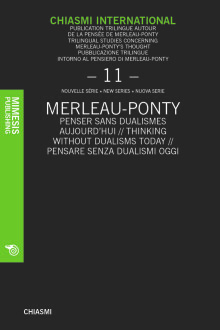 From Italy to Mexico, and all the way to Japan, then back to the United States: the annus mirabilis of the centenary of Merleau-Ponty’s birth was celebrated everywhere. Chiasmi International has captured some of its most important echoes in this issue, which also presents important changes in the journal’s structure, including reviews and a new section of essays “around” Merleau-Ponty’s thought. This special issue, with which Chiasmi International celebrates its tenth anniversary, features the contributions of Merleau-Ponty specialists among the most representative of four different generations. Textes de // Texts by // Testi di: Suzi Adams, Emmanuel Alloa, Alia Al-Saji, Claudia Baracchi, Josep Maria Bech, Paride Broggi, Mauro Carbone, Paola Chiesa, Françoise Dastur, Daniela De Leo, Carmine Di Martino, Lester Embree, Véronique Foti, Simone Frangi, Giovanni Invitto, Stefan Kristensen, Mariana Larison, Federico Leoni, Enrica Lisciani-Petrini, Liu Zhe, Shôichi Matsuba, Rita Messori, Pierre Rodrigo, Davide Scarso, Emmanuel de Saint Aubert, Beata Stawarska, Luca Taddio, Jacques Taminiaux, Tommaso Tuppini, Luca Vanzago, Jean-Jacques Wunenburger.